What Role Did Gender Truly Play in the U.S. Presidential Elections? Off-Broadway’s Her Opponent Aims to Find Out. Currently offering Off-Broadway audiences plenty to think on and talk about, Her Opponent, a new show co-created by Maria Guadalupe and Joe Salvatore, has audiences reevaluate excerpts from the 2016 Clinton/Trump debates by switching the speakers' gender. To get the inside scoop of the gender reversing documentary theater piece, OUT spoke with both co-creators to really dig into how gender roles played out in the latest U.S. election cycle. OUT: What moment inspired you to create Her Opponent? Maria Guadalupe: Watching the first debate, it was mostly the non-verbal aggression of Trump, the interrupting and yelling and finger-pointing, that I found totally inappropriate. The excerpts were chosen so that they would be continuous segments that would include interesting interactions between the two candidates and cover a range of issues. I explicitly excluded the “sexually charged” segments though. Joe Salvatore: When Maria contacted me about working on this project with her, I had zero hesitation. It was an immediate "yes." When does an economist ever contact a playwright-director to collaborate on a research project? Also, I love working in this style of verbatim performance, and it seemed like a great opportunity to investigate the election process and these candidates through theatre. After Maria chose the excerpts, we re-examined the beginning and ending moments a bit more to find the strongest places to start and stop, making sure that the audience could understand something about the context for each candidate's comments. At the top of the performance, the audience is informed that they are about to witness a social experiment. Do you think it's the experience of audience members or the announcement that primes them to watch the show with a certain focus? Maria Guadalupe: In reality, we are often part of “experiments”—marketing and else—without knowing it. I myself do “experiments” in my research to try an understand "how things work" in the real world. But people only find out they are part of an experiment after the fact. In this setting, the audience knows they are part of an experiment, and this is very important because it is what allows them to compare their now feelings and reactions to what they felt in the original debates. We turn each person into a scientist analyzing their now emotions! This is the lens we’d like to turn on. We also have this initial speech so that people know that this is not “satire” and that we are reproducing the original debates as closely as we could. Joe Salvatore: This part of the performance is very important and intentional, as we're not doing a traditional play. 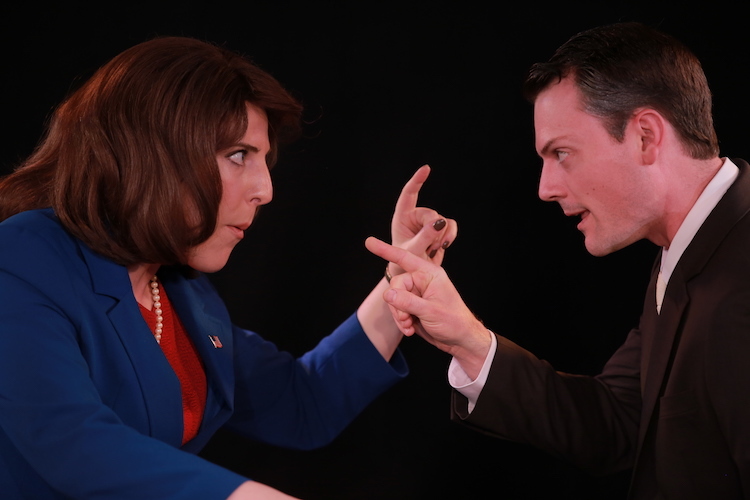 We have the fictional characters of Brenda King and Jonathan Gordon, but the actors playing those characters are recreating the speech patterns, gestures, and movements of Donald Trump and Hillary Clinton respectively. It's important that the audience understands those "rules of engagement" from the very beginning. The experience is meant to be an exercise in critical thinking and analysis as much as it is a piece of theatre. It's also why the actors are introduced using their actual names at the top of the performance. It needs to be clear that these are actors playing characters, not transforming into characters, which is how audiences usually experience a more traditional play. How do you think flipping the gender on stage affects the audience? Joe Salvatore: The gender flip creates a cognitive dissonance for audiences, an interruption of their preconceived notions, and this allows them to see what they once perceived as familiar in a new and different way. Some audience members have commented that just by experiencing the text and gestures through the voices and bodies of two unknown people allowed them to see and hear things differently. Because the election cycle lasts as long as it does and because we have 24-hour access to news about them, we become saturated with experiences with the candidates. And in the case of Clinton and Trump, we've had decades of over exposure. So, the interruption of our implicit bias around the candidates really allows us to see things differently. And the gender flip also causes people to question their own assumptions around what they perceive as "appropriate" and "acceptable" behavior for men and women in positions of power. That questioning can be quite unsettling, I think with positive ramifications. Trump's words and mannerisms, when performed by a female, create a very agentic female. Audiences can be exhilarated and horrified by this. Maria Guadalupe: We have had a range of reactions by audiences to the female Trump. More frequently, we see that they prefer the female to the male Trump. But, we have also seen the opposite from conservative audiences. The female Trump is more appealing because, coming from a female actress, the “aggression” comes off as less menacing, than from a big, tall man like Trump, that we now consciously or unconsciously associate with degrading comments towards women. That all disappears in the female actress, and people, instead, see “passion." Joe Salvatore: I love that many audience members polarize around the Brenda King character. If we all agreed on one interpretation or perspective, we wouldn't need to do this project. I have a lot of respect for the Brenda King character, and I've been continually surprised by that. I disagree with her ideas about what's good for the U.S. and the world, but I appreciate her ability to say how she feels and to make her points clearly for an audience. I could not see that with Trump because of my personal feelings about him and his past. I think many audience members, and I include myself here, are drawn to the strength of Brenda King because she offers us a fantasy version of possibility. People say that a woman behaving that way could never ascend to the candidacy, and I recognize and acknowledge that. However, watching her, I begin to wonder about a United States where a woman like Brenda King could ascend. Seeing a man perform the socially acceptable traits of a female leader allows Clinton supporters to really explore and understand the claims that she was not relatable and came across as disingenuous. Maria Guadalupe: Her Opponent has made us all, and we include ourselves there, see things that we did not see before. I agree with you that Clinton as Jonathan Gordon appears less attractive and non-relatable. One could jump, therefore, to the conclusion that she was not relatable—and she was not to many. But, the question is “why?” What is happening in the theater that changes things so much? To me, a big realization when seeing Clinton as a man was that what I saw as strength, command, and poise in Hillary—features I value in anyone, and especially in someone with access to nuclear codes—was seen as weakness and submissiveness in Jonathan Gordon. Like the smiling and nodding while being attacked. This is typical “female” behavior, and it is shocking to see that what we have come to expect from a woman, even one running for president, looks so off-putting when done by a man! Audiences have even referred to the “femininity” of Jonathan Gordon as off-putting. In the theater, we look at things mostly through an emotional lens. In that sense, Clinton was more “cerebral” than Trump, and for those not looking at policies that would be absolutely boring. Now, where I think the play is successful there is that it shows us and makes us feel in ourselves how easily we can be manipulated by form emotionally. But, if we can be so easily manipulated, what does this say about our democracy? Joe Salvatore: This has been the most difficult part of this project me for a couple of reasons. First off, I've been a Hillary Clinton supporter for years. I met her very briefly at an event when she was running for Senate in New York, and in my very quick interaction with her, she shook my hand, looked me in the eye, and connected. And, I watched her do that with every single person in the room. I have not forgotten that moment, however brief, and I've struggled watching how she reads in larger, more public interactions. As a director, I coach actors to pretend to be someone they're not so that an audience believes in them, and as a result I can tell when people aren't behaving in an authentic way. When I met her one-on-one in a smaller group setting, Hillary Clinton projected a clear authenticity that I was not expecting from a politician, and that's why I've continued to support her all of these years. Very early in the process of creating this piece, I became aware of the inauthenticity coming through the Jonathan Gordon character. I had sensed it in Hillary's larger public appearances for years, but coming through a man's voice and body, it just amplified it for me. And, that has really caused me to reflect a lot about what I've taken for granted as a male who often finds myself in a leadership position as a director or teacher. Many of our female audience members have talked openly about the smiling, how that's a learned behavior that they're required to master to move forward in their daily interactions, particularly at work. I find myself thinking about it a lot. I also think about the critique of Jonathan Gordon's effeminacy that we've heard from audience members over and over again. I learned early on as a kid that it was advantageous to erase effeminacy from my voice and body as much as I could, for better or for worse. As I've gotten older, I've found ways to resolve that and even embrace my effeminate qualities, but the audience response to Jonathan Gordon has reminded me that we're carrying all sorts of implicit gender biases into our daily interactions with one another. And, as the first female candidate for President of the United States, Hillary Clinton was carrying the weight of those implicit biases in ways that I can't begin to fathom. It's easy for any of us to critique Clinton's inauthenticity, until we try walking around with the weight of those implicit biases. Swapping the genders of the candidates says a lot about how we, as a society, expect men and women to behave when in the public gaze. In your opinions, are we making any progress towards parity between the genders or is Her Opponent proof that we are actually regressing? Maria Guadalupe: I think we are making progress. But, the key to further progress is to have more female role models, women in leadership roles so that the range of what is “acceptable” as a woman widens. This is good not just for women by the way! We all have a feminine and masculine side. Allowing for a wider range of roles and behaviors would benefit all of us by letting us be who we truly are in our public roles and not be always judged by a traditional male dominated rule. I also like saying, only in half-jest, that Her Opponent shows that we prefer female politicians. Audiences seem to like Clinton more as a woman and like Trump also more as a woman! Joe Salvatore: I would say that progress is there, but it's glacial and therefore frustrating and difficult to see or feel. I'm learning a lot about my own biases around what I assume to be the "right" way to think or feel about an issue. It's that paradox of "you can think what you want to think as long as you agree with me." I think that we have to investigate beyond the surface on these issues. I'm starting to realize that the more we talk to one another the more likely we are to locate common ground. And, then, the common ground allows for the conversation to move forward, hopefully carrying us into territory where we need growth. This is why we've built the audience discussion piece into the performance. It creates a space for something to happen. The younger generations are heavily engaged in gender nonconformity. What do you think a mixed gender identity presidential debate will look like in 2036? Joe Salvatore: I work with undergraduate and graduate students at NYU, and I spend time interacting with K-12 students in New York City schools. I see gender nonconformity manifest in a variety of ways on a daily basis. I like to think that as society becomes more accepting of gender as a fluid construct, a 2036 presidential debate will look quite different. But, given how long it's taking us to take steps forward and then the recent threats to those steps forward, I worry that progress may slow way down again. Even in a moment when progress has been made, we faced a number of questions about how to costume Brenda King and Jonathan Gordon, largely because of the confines of gender. We did not feel that we could put Jonathan Gordon in a white suit for the excerpts that we perform from Debate #3. We didn't think that an audience would take it seriously. So, even in 2017, when we see evidence of progress in younger generations, we still have to accept the perceived limitations of the majority of the electorate, which is also our audience. What are your hopes for the future of Her Opponent? Maria Guadalupe: We hope that we will get as many people as possible to see it and comment on it. Live, but also on film. We believe it gives rise to important conversations and reflections that are hard to have. Not just about gender, but also about politics, leadership, and democracy. And, we believe it allows us to question a bit ourselves and our often too strongly held opinions. We are also planning other similar “experiments,” so stay tuned! Joe Salvatore: I would just add that I hope that people continue to engage with the performance as a way to think through their decision-making processes for selecting leaders, whether it be in government or in the workplace. And, I'm grateful that Her Opponent can serve as a catalyst for dialogue, and I want that to continue.